We were just a few months into our marriage, and I found myself curled up in bed with tears trickling down my face, thinking, “I want to go home.” But then I realized I was home. In our home—the one my husband and I bought together with bright smiles, excitement, and all the hope our young bodies could contain. Even though I was only twenty-four when we got married, I wasn’t naive to the idea that marriage would be difficult—after all, most of the people in my life told me this journey would be challenging at times. I had heard all kinds of advice before we got married (“Don’t go to bed angry,” for example, and, “Always assume the best of your spouse”). I thought I was prepared. And maybe I was prepared for the “easy” stuff—I was prepared for when it came to arguments over who would do the dishes and vacuum the floors—but this? I was not prepared for this. This was something different, a feeling I had never experienced. It was a hopeless, sad sensation. It was heavy and overwhelming, like a dark cloud that wouldn’t let the light in. I briefly considered leaving and making the hour-long drive to my mom’s house, but that felt wrong. No, as unpleasant as this was, I needed to stay. I didn’t know what was going to happen or if I would feel better that night; I just knew I couldn’t run from this. If you asked me now, I’m not sure I even know what this was. Truth be told, I cannot for the life of me remember what my husband did or said that sparked such an intense reaction. I only remember the sadness and confusion and hopelessness, and the questions I couldn’t answer: What have I done? Was this a mistake? Are we a mistake? It sounds dramatic, but I’ve always believed marriage to be a risky endeavor—and I’m not typically a risk-taker. As a child, I watched my parents’ marriage dissolve into a puddle of pain and brokenness, and it just wasn’t something I wanted to recreate. 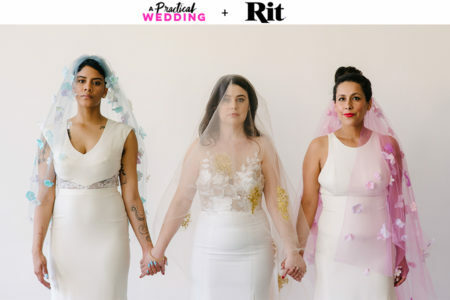 While many of my peers couldn’t wait to plan elaborate weddings and buy white dresses, I saw the prospect of marriage as something terrifying that might take away my independence and ultimately crush me. Romantic, right? Throughout our engagement, I considered ways to avoid actually getting married and just be together, because, you know, I loved the guy. The idea of marriage was scary, but being with him was not. I’m happy to report that we ended up making it through that night with our marriage intact. My husband came to me as I cried in bed and apologized, and I hugged him and said I was sorry too. In that moment, the hopelessness and fear slipped away, and I was left with peace. We were going to be okay. I’ve looked back on that night many times, wondering why it’s something I bother recalling at all. It certainly isn’t a happy memory. And it wasn’t the last time we would fight, nor the last time I would question what the hell we were doing, if our marriage was serving us, and if we could make this thing work while remaining happy and whole. Somehow, this memory has stuck in my brain. It’s made a lasting impact, and it’s something I share with close friends when discussing marriage’s challenges and hardships. I think this was the first time I got a glimpse of what marriage might really be, at least for me. It’s about knowing it could all fall apart, and that maybe it won’t always make sense or give me warm fuzzies, but it’s worth the gamble. This journey of marriage is worth the risk of divorce, pain, discomfort, tears, and sacrifices, because there’s another side that comes with some of the most beautiful things I’ve experienced. My marriage has resulted in deep connection and joy, and sometimes there’s no better comfort than knowing we are committed to navigating our way through this world together. It’s shown me a level of love I didn’t know was possible, which feels downright magical and other-worldly. Marriage still hasn’t turned me into a gambler or a risk-seeker; on a recent trip to Las Vegas, I tried my luck at a few slot machines and gave up after losing about $20. Instead, marriage has shown me there are chances worth taking and there are people who are worth all of my proverbial chips, potential failure and heartbreak be damned. You may argue that I could have experienced all of these wonderful things without a marriage certificate, and you might be right. But there’s a big part of me that wonders if I had to take the plunge into marriage’s deep and uncertain waters to uncover the magic. For me, choosing marriage was taking a deep breath and hoping I wouldn’t drown as I jumped in—knowing I would flounder and struggle and maybe even sink for a while, but believing that perhaps I could swim my way back to the surface and grab on to something, or someone, secure. While I love the days when I feel as if we’re floating along in peaceful, calm waters, I know the waves that come crashing in with the storms have made and continue to make us stronger. Sometimes those waves are high, but despite my fear, I keep putting my faith in our ability to swim—to fight, persevere, and stay afloat—and we do. This post originally ran on APW in August 2016.